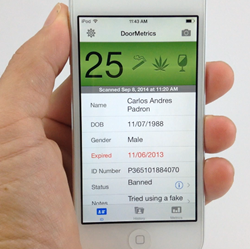 DoorMetrics ID scanner app for iPhone releases ‘Colorado Edition’ to prevent underage purchases of Marijuana in Colorado and Washington State. Application for iPhone or iPod Touch announces major updates to include cannabis notifier, ID scanning via the iPhone's built in camera, added hardware support and lower price. DoorMetrics, Inc today introduced a major update to their iPhone application that allows users to verify and check the age of customers who are purchasing not only alcohol and tobacco but now cannabis and related products. The Colorado Edition is available as an in-app purchase and is available for download as of today. The app’s price has also been reduced from $9.99 to $2.99 and adds the capability of scanning the barcode on a US or Canada issued ID via the built-in camera on an iPhone or iPod Touch. Without the need for additional hardware to operate, this vastly reduces the initial investment by business owners who are looking for inexpensive ways to protect their establishment from potential legal trouble resulting from employees serving an underaged person. DoorMetrics was initially released in 2012 with ‘under the radar’ success, quickly becoming the go to ID scanner system for more than 1000 establishments around the US and Canada. A hand-held tool for doormen, security guards, cashiers, bartenders or waitresses, DoorMetrics begins with one of two focuses: verify the age of customers while at the same time, collecting demographic data about them. Either connect a compatible device to the iPhone or by using the built in camera, a user either scans the barcode on the back of a customer’s ID or slides it through the magnetic stripe reader. The age of the person is then clearly displayed on the screen with options for inputting information such as email address, phone number, status or notes about the guest. This data can either be viewed on the device, exported in .CSV format via a wifi connection and email or deleted immediately depending on State laws. DoorMetrics V2.2 was designed for Apple® devices iOS 7.0 or later and is available to download on the iPhone app store: http://https://itunes.apple.com/us/app/doormetrics/id441744173?mt=8. for $2.99.. The app now supports ID scanning via the iPhone or iPod’s camera but for commercial use we recommend using one of the following compatible external devices: Linea Pro 5, Honeywell Captuvo, or the iMag Pro 2 which are all available for sale on the DoorMetrics website. DoorMetrics, Inc is an app development and design company operating out of Miami Beach, FL the center of nightlife on the East Coast. Our primary focus is on the creation and design of mobile applications for the Food, Beverage, Hospitality and Security industries. For more information, visit http://www.doormetrics.com or call (786) 353-7226.